Senate begins debate on immigration and the fate of "Dreamers"
WASHINGTON — The Senate begins a rare, open-ended debate on immigration and the fate of the "Dreamer" immigrants on Monday, and Republican senators say they'll introduce President Donald Trump's plan. Though his proposal has no chance of passage, Trump may be the most influential voice in the conversation. If the aim is to pass a legislative solution, Trump will be a crucial and, at times, complicating player. His day-to-day turnabouts on the issues have confounded Democrats and Republicans and led some to urge the White House to minimize his role in the debate for fear he'll say something that undermines the effort. Yet his ultimate support will be vital if Congress is to overcome election-year pressures against compromise. No Senate deal is likely to see the light of day in the more conservative House without the president's blessing and promise to sell compromise to his hard-line base. Trump, thus far, has balked on that front. "The Tuesday Trump versus the Thursday Trump, after the base gets to him," is how Sen. Jeff Flake, R-Ariz., a proponent of compromise, describes the president and the impact conservative voters and his hard-right advisers have on him. "I don't know how far he'll go, but I do think he'd like to fix it." Senate Majority Leader Mitch McConnell, R-Ky., scheduled an initial procedural vote for Monday evening to commence debate. It is expected to succeed easily, and then thew Senate will sort through proposals, perhaps for weeks. Democrats and some Republicans say they want to help the "Dreamers," young immigrants who have lived in the U.S. illegally since they were children and have only temporarily been protected from deportation by an Obama-era program. Trump has said he wants to aid them and has even proposed a path to citizenship for 1.8 million, but in exchange wants $25 billion for his proposed U.S.-Mexico border wall plus significant curbs to legal immigration. 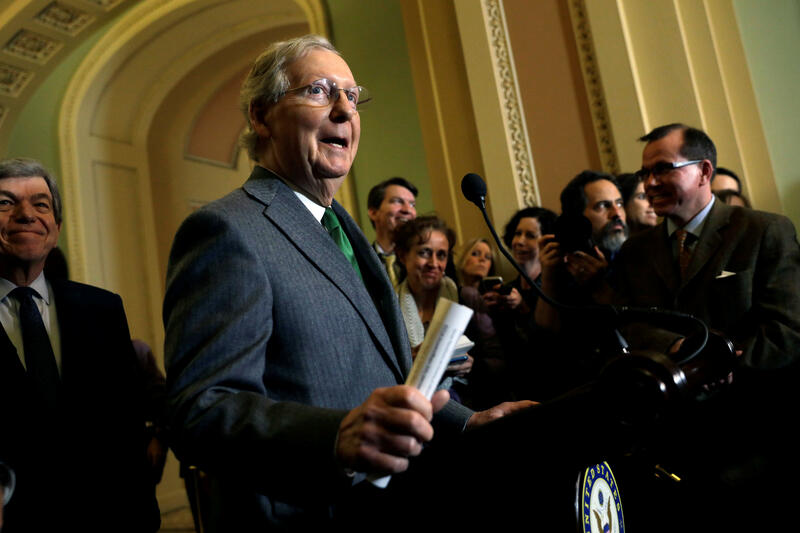 McConnell agreed to the open-ended debate, a Senate rarity in recent years, after Democrats agreed to vote to end a three-day government shutdown they'd forced over the issue. They'd initially demanded a deal toward helping Dreamers, not a simple promise of votes. To prevail, any plan will need 60 votes, meaning substantial support from both parties is mandatory. Republicans control the chamber 51-49 but GOP Sen. John McCain of Arizona has been home for weeks battling brain cancer. Seven GOP senators said late Sunday that they will introduce Trump's framework, which they called a reasonable compromise that has White House backing. The group includes Sens. Tom Cotton of Arkansas, John Cornyn of Texas and Iowa's Charles Grassley. Democrats adamantly oppose Trump's plan, particularly its barring of legal immigrants from sponsoring their parents or siblings to live in the U.S. It has no chance of getting the 60 votes needed to survive. The plan will give GOP lawmakers a chance to stake out a position, but it could prove an embarrassment to the White House if some Republicans join Democrats and it's rejected by a substantial margin. Another proposal likely to surface, backed by some Republicans and many Democrats, would give Dreamers a chance at citizenship but provide no border security money or legal immigration restrictions. It too would be certain to fail. Some senators have discussed a bare-bones plan to protect Dreamers for a year in exchange for a year's worth of security money. Flake has said he's working on a three-year version of that. "I still think that if we put a good bill to the president, that has the support of 65, 70 members of the Senate, that the president will accept it and the House will like it as well," Flake told NBC's "Meet the Press" on Sunday. Underscoring how hard it's been for lawmakers to find an immigration compromise, around two dozen moderates from both parties have met for weeks to seek common ground. So have the No. 2 Democratic and GOP House and Senate leaders. Neither group has come forward with a deal. In January, Trump invited two dozen lawmakers from both parties to the White House in what became a nearly hour-long immigration negotiating session. He asked them to craft a "bill of love" and said he'd sign a solution they'd send him. At another White House session days later, he told Durbin and Graham he was rejecting their bipartisan offer. He used a profanity to describe African nations and said he'd prefer immigrants from Norway, comments that have soured many Democrats about Trump's intentions. The court's blunting of the deadline has made congressional action even less likely. Lawmakers rarely take difficult votes without a forcing mechanism — particularly in an election year. That has raised the prospect that the Senate debate launching Monday will largely serve to frame a larger fight over the issue on the campaign trail.